Ask fellow campers about "Elkhart County Fairgrounds" and nearby attractions. Large fairgrounds with several camping areas all with full hookups. To enter the grounds find gate 2 on CR 34 (road) as this is where the office is located. It is $35 full hookups or $25 if you only use water and electric (not including tax). They do have weekly and monthly rates. There are grass sites and gravel sites that looked fairly level. Almost all the sites are back-in and looked like it could get really crowded if full. This time of year though, most of the sites were empty. Make sure you check the fairground schedule as they may not be open to public camping during events. There are restrooms with showers, and several areas to walk around on the grounds. Some of the water and electric connections looked older. The grass sites could get very muddy during rain. We felt safe here, it was quiet except for occasional trains. Would stay here again. 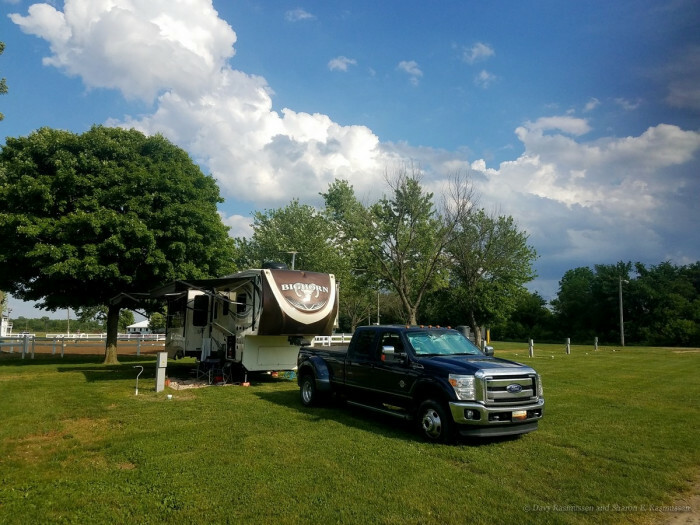 We camped at Elkhart County Fairgrounds in a Fifth Wheel. Lots of Amish shops to explore, RV surplus and furniture stores in the area. This is an extensive fairgrounds area. Our campsite was simply an open grass field with water and power poles. Staff were friendly. Our water faucet stem had such a leak it would have flooded our site if left on overnight so we turned it off. The 50 amp plug was defective but the 30amp worked. Our site was almost level. Fairgrounds interesting to walk around. 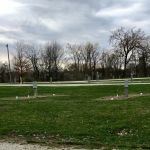 Close to Lippert and most RV companies so this park is convenient as a utility type RV stop. We camped at Elkhart County Fairgrounds in a Motorhome. RV Hall of Fame more interesting than we expected. Worth a trip. Lippert repair shops 10 minutes away. We stayed here during an RV Rally and were in the infield of the race track, not a regular site. We had water and electricity, but other sites had sewer. The grounds here are landscaped beautifully. Flies were a problem since a fairground is host to animals at times. We camped at Elkhart County Fairgrounds in a Fifth Wheel. This is in the heart of Amish country and the RV Industry. Factory tours are available and there is an RV Hall of Fame. Many Amish businesses and restaurants plus the large flea market at nearby Shipshewana offer plenty of things to do. We stay here very year for the FROG Rally. great staff and the grounds are very well kept. They have a traditional camping section but also fairgrounds type camping, this year we had over 600 units attend this rally and parking was great and everyone seemed pleased. 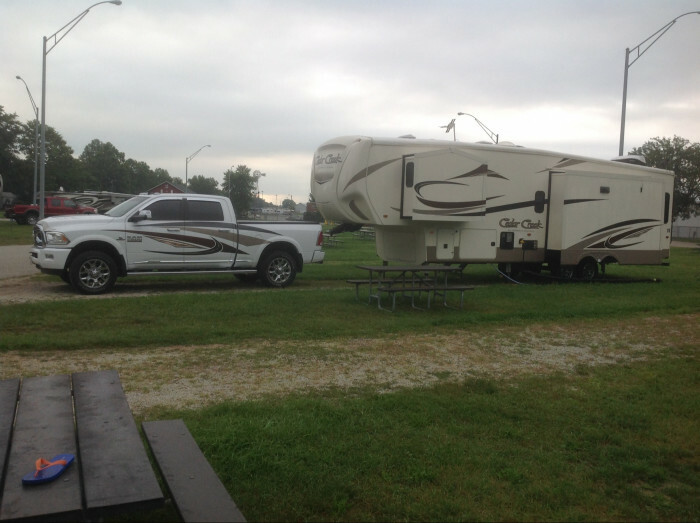 We camped at Elkhart County Fairgrounds in a Fifth Wheel. We stayed in the Northeast campground with water and electric only. We were the only ones in that section. The whole campground was on quite a slope. We parked facing up the slope first but the auto level was unable to level that way, so we hooked back up and faced down the slope. We had about 6" blocks under the front legs but they still had to extend a long way to get level. It is hard to navigate the fairgrounds if you don't know where you're going and we didn't! Sites were all grass as if you were in a field. In the morning the worker started mowing pretty early. We had to figure out the roads before we went to dump. 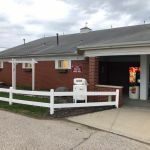 It was an OK place to stay and cheaper than anywhere else in that area, plus it is close to Lippert Components where we had work done on our RV. 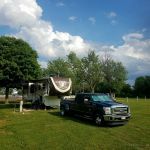 We camped at Elkhart County Fairgrounds in a Fifth Wheel. There is a lot to do in this area. 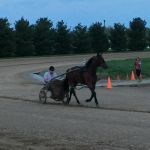 We visited the RV Hall of Fame and the Amish festival in Nappanee. Also took a tour of one of the RV manufacturing plants. The area is very Amish and Shipshewana and their flea market is quite close. Stayed two nights to rest a bit on a cross-country run after a couple of Walmart nights. We chose the W/E section to save money, and it was fine. There were few people there during our stay. The larger campground section was preparing for the fair that would start in a couple weeks. Our site was adequate, and for the price you can't complain. We were allowed to select the one we wanted, so we chose one that would get evening shade from the row of trees as the sun was setting. The rest of the day it was in full sunlight. The bathrooms were individual rooms with a complete bathroom setup in each. Fortunately they lock with deadbolts, as there was a crazy person banging on my door and yelling when I was showering. I called my husband and he came over and kept watch while I finished (he didn't see anyone). Keep in mind that anyone can come into the fairgrounds, and be aware of your surroundings! It's a great place for an overnight or two or three. The train noise didn't bother us, even though it's fairly close. We camped at Elkhart County Fairgrounds in a Fifth Wheel. Das Dutchman Essenhaus - great food, pretty grounds. Nice place to walk around and take a break. Lots of interesting things to do in the area, including the RV museum. Since it's the hub of all things RV, I'm sure we'll be back to partake in more activities in the future. We were coming into the area for some RV Repairs and chose the fairgrounds due to their great location and also because they just wrote our name down when we called for reservations and asked if we would call if we needed to cancel. How nice is that. This is a large fairground and they have camping areas scattered all around. We chose their 50 amp full hook up area, which happened to be right next to a couple horse corrals. We had live entertainment each day. All the sites are large and easy to back in or pull thru. The staff was friendly and they provided a great packet of information that helped point us to a few fun adventures while we were in the area. $33 for full hookup 50 amp and $25 for 30 amp and water. 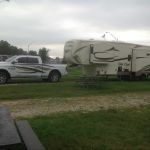 We camped at Elkhart County Fairgrounds in a Fifth Wheel. Brings bikes and take the pumpkin vine trail from the fairgounds into Goshen. Stop by the Goshen Brewing Co and if you time it for the first Friday of any of the summer months, downtown Goshen fills with music, events and great food. Our stay in this park was for a rally being held on the grounds. Some of the nicest people that we have meet. All hook ups worked great and where located toward the back of site. Sites were a little close but were laid out very well. Great location the only negative was the trains which were close to campground. We camped at Elkhart County Fairgrounds in a Motorhome. Have stayed here several times. The staff is friendly, the sites are easy to get in and out of. There is much to do in the area. My go to campground when I'm near Goshen. We camped at Elkhart County Fairgrounds in a Fifth Wheel. We stayed here as part of Tiffin rally with 325 rigs. Excellent facilities for a large group. We arrived two days early, so we had one of the better sites, away from the train tracks. The trains come through continuously throughout the day and less frequently after dark. Camping on grass, level sites. Sites were scattered throughout the grounds. Most are very close together, which would normally bother me, but we quickly made friends with surrounding Tiffin owners. Parking for toad vehicles was tight in some rows and spacious in other places. Several nights of rain while we were there resulted in some puddles in places. Their conference rooms were very nice and used for seminars by Tiffin. Also used the large hall for nightly dining. We had full hookups, but showers and bathrooms were clean and in good repair for those without sewer hookup. If attending a large rally at the facility, plan on arriving a day earlier to have a better selection of campsite. Depending on the size of your group, you could be closer to the railroad tracks, or not have sewer connections. We camped at Elkhart County Fairgrounds in a Motorhome. We stayed here for a Tiffin rally. We were far from the railroad tracks so had little noise. Showers were spotless as we're toilets. 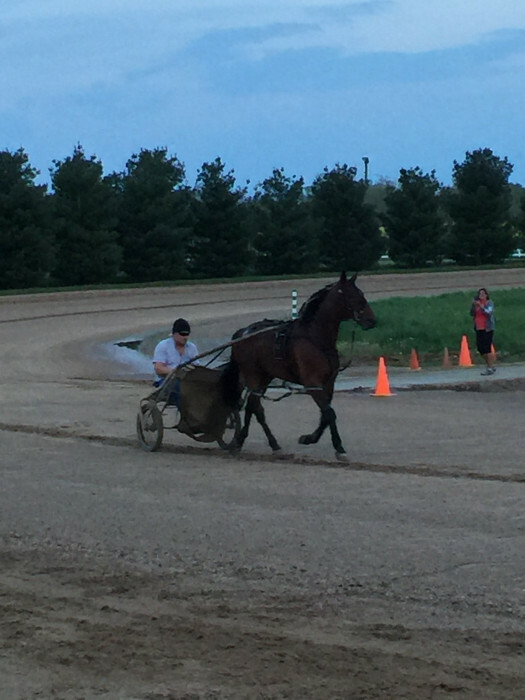 Our site, #1, backed up to the race track so we were treated to horses exercising on the track. Fun to watch! Good OTA reception, easy to navigate and well kept grounds. Felt safe and area was well lit. Parking is on grass so if there is rain there is a chance of water ponding. 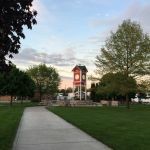 We camped at Elkhart County Fairgrounds in a Motorhome. Plenty of shopping in the area. Roads are easy to navigate. Spend time watching the horses on the track. We were here to attend the Tiffin Allegro Club Rally. Our site was a back-in on a grass field with temporary 30 amp and water connections. We had good Verizon cell and internet reception and good DishTV satellite reception. We lost electric power several times due to a bad 200 amp breaker that provided power to 16 coaches. The train tracks were close by and the trains ran constantly day and night. We enjoyed the rally, but the campsite was a bad experience. 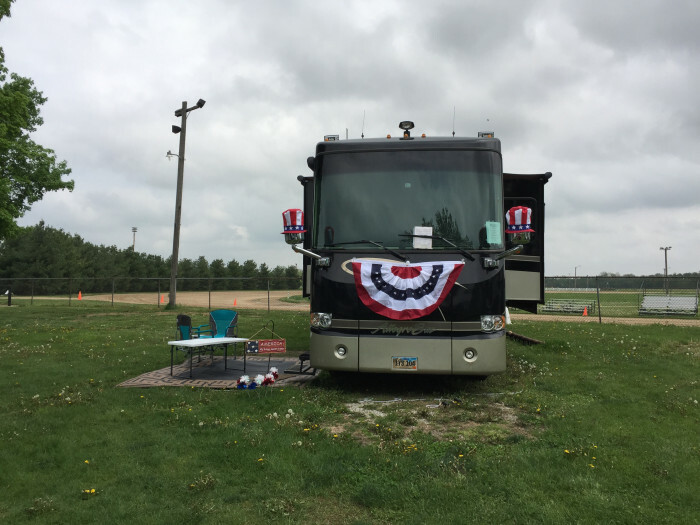 We camped at Elkhart County Fairgrounds in a Motorhome. We were here for a rally. Sites are very narrow when all full. Our door almost opened into our neighbor's slide. For a rally it was OK, but we would not otherwise like being so packed in. Access was OK. GPS could not find the entrance. Trains all day and night. Nice grounds and facilities for a rally. Wifi weak in our location but good near buildings. This place would be OK if there is not an event going on and not full. 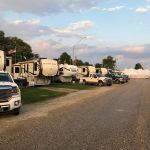 We camped at Elkhart County Fairgrounds in a Motorhome. There are lots of Amish and Mennonite communities around to visit. 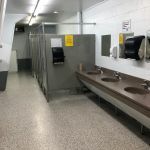 Nice county/4H fairgrounds with electric only to full hookup sites. Parking is on grass so it can be a challenge if there is rain. Has a very busy train track right next to one side of the campground and during our rally there were rigs parked there so they had to have extreme noise. Fortunately, if there is no rally going on there are spaces far away from the tracks. Fairgrounds is conveniently located for seeing the area. All the surrounding communities are within easy driving distance. Over the air TV is acceptable as is Verizon service. Missing are pool, spa, picnic table, fire ring, pet run. Other than the trains, it is quiet at night. Might be hard to obtain a space during fair time. We camped at Elkhart County Fairgrounds in a Motorhome. Nice location to park for a few days to see the area sites. Don't forget the RV/MH Hall of Fame. Park is very clean and accommodates over 500 rigs. We stayed for the Maintenance Session of 419 Monaco with 258 others. All buildings and grounds were very good with good full hookups. Many OTA channels for TV. 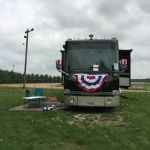 We camped at Elkhart County Fairgrounds in a Motorhome. Many Amish activities and shopping in the area. RV surplus stores like Bontrager are close and great for repairs and alterations. 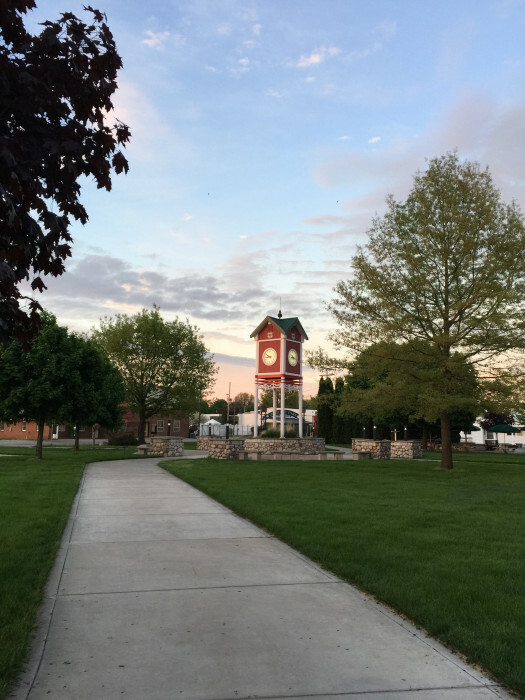 Goshen is less than a mile for all types of food and shopping. Walmart within 2 miles. Would be a great place to stay while visiting the area. A bit out of the way for an over night stay while travelling. The Fair Grounds are nice and clean and very friendly. If your are into RVs, there are numerous RV manufactures in the area. Most offer factory tours. If you are interested in finding out information on the Amish then a trip to the Menno-Hof information center is well worth it. The campground is in the middle of the Amish Country and there are lots of places to visit, tours and places to shop and eat. It is also the largest RV manufacturing area in the U.S. so you could get tours of several plants as well as the National RV Museum. There's a long rail-trail bike path just south of the park. Goshen has a cute downtown and some nice restaurants. Goshen Brewery is great - farm-t0-table, local ingredients and tasty beer. The fairgrounds are right next to the railroad tracks, so if you need peace and quiet to sleep like I do, be sure to bring ear plugs. The fairgrounds is also well lit, so consider a sleep mask if you need it dark at night to sleep. We did not go into town due to the rally but Goshen is very close, Elkhart is nearby and much to do with the Amish community. This is a large Amish community. Be careful when driving! Great Bend, IN including Notre Dame University. Shipshewana. Elhardt, IN where nearly all RV's are manufactured. There are numerous interesting and fun activities to do in Middlebury and Shipshewana. It would be best to camp in one of these cities for a few more dollars per night. Good local coffee shop on Washington Street in downtown Goshen. The fair grounds is in a good location to tour the many interesting Amish business in the area. Plenty of things in the area do or visit. Visit the factories if your rig was built in this area. Just live and enjoy this area of Indiana. Much to see and do if you're up to it. More to do in the area than you can do unless you have at least a week. RV factory tours and the RV Hall of Fame, automobile museums, flea markets, Amish crafts and food. We plan to return when we have more time. Stay elsewhere if you are a light sleeper. The 419 MS offered an evening meal off site at a local Amish farm. This was a fantastic experience and would almost consider attending a future MS rally just to do that again. When registering, ask for the free CD of the Heritage Trail. It's very interesting, and the map shows the location of all the quilt gardens and murals. Plenty in the area to see & do. Good eating places on CR 33 southeast (Lincolnway). SuperWalmart, Menards and other retail out this way too. Take the Amish buggy ride and dinner in an Amish home tour out of Shipshewanna - a great experience, good food with good people. Flower quilt trail, Amish community, countryside drives. Many good local restaurants, big-box stores nearby. Many of the RV factories are within 20 miles for easy visits for service. Beautiful country, lots of good shopping, restaurants all close by. Nothing within walking distance, but only a few minutes by car. Visit the RV manufacturers while here. The factory tours are very educational! Are you affiliated with Elkhart County Fairgrounds ?